You get to sit at a desk all day. I had an idea to make sitting at your desk a little more fun this month. Last week, I came across a great 12-exercise desk routine that stretches and strengthens your whole body. Realistically, though, I’d say the last five are only doable if you’re in a fairly progressive office (not sure about doing rotating lunges in the civil service… ). The first 7 exercises, though, are great for opening up the chest, strengthening the upper back, and loosening up the spine, all of which are really important to counteract that static sitting you do all day. 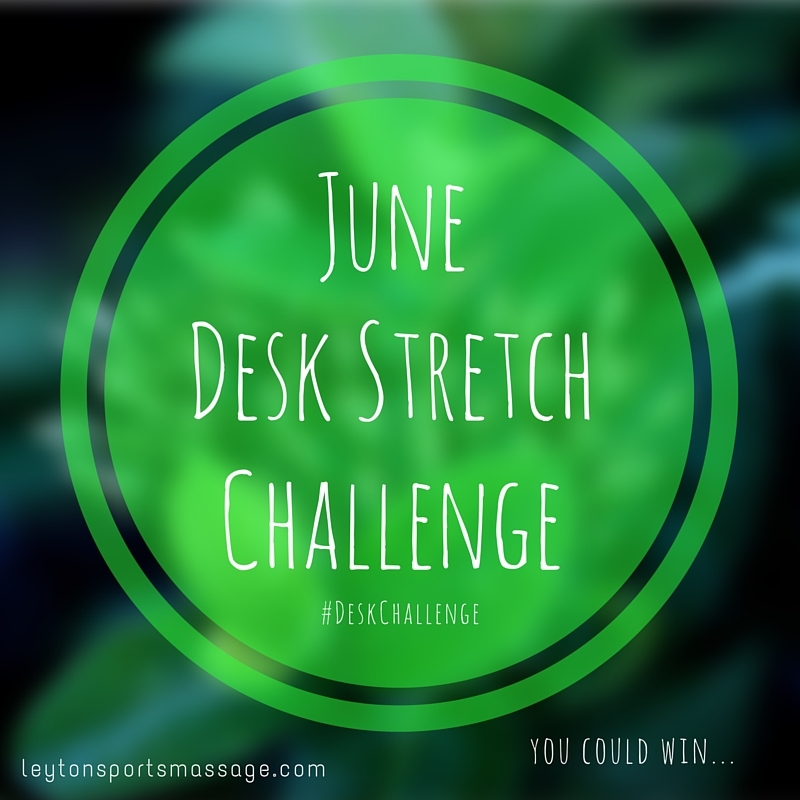 Here’s the challenge: any week in June, starting on a Monday, choose 3 exercises that you will do at your desk every day at about the same time, for five days. Everyone who completes the challenge will be entered into our prize draw, and winners will be chosen at random at the end of the month. Choose 3 exercises/stretches that you think you can reasonably do at your desk without feeling embarrassed and that will help you the most. Personally, my favourites are #1, #2 & #5, and I recommend doing them just after lunch or mid-afternoon. At the end of the week, we’ll ask you to take a minute to see how different, if any, you feel for consistently doing these stretches five days in a row, via a really, really short survey. Each way you share it you get one extra entry. Doing a few stretches every day can really help with common problems that come with sitting at a desk. For every friend who joins in the challenge because of you, you’ll get another entry to the prize draw. Why not see if you can get your office to do it all together? and if you’re signing up someone else (or because of someone else) let us know who that is. I think you’ll be really surprised what a difference just a few minutes a day of stretching will make. *Terms & Conditions of the challenge: you must notify us that you’ve participated in the challenge no later than the 30th June, and provide confirmation of any additional entries via sharing on social media or signing up friends (can be sent via email). Participants also need to provide a reliable method of contact, which can include facebook, twitter, email, or phone number. Winners will be chosen at random via an online software no later than 7 July, and contacted via their preferred method within that week. If no response has been received within 7 days of contact, their prize will be passed on to the next person. Prizes of massage session is valid at Leyton Sports Massage, at either our Leyton or Walthamstow location and Indian Head Massage at Leyton only, and is valid for one year, with booking subject to availability. Massage ball can be posted to anywhere in the UK or picked up by prior arrangement at Leyton or Walthamstow location. thank you for this, love the exercises. I will do #1, #3 and #5 starting tomorrow 13th June at 3pm. Thank you for setting up the challenge, it’s good to have some encouragement and something to boost motivation. My team of staff have been doing this this week and it feels good to take some time out to move out muscles!